On October 15, 1893, a certain Jacques Tschumi, member of the Swiss Hoteliers Association, gathered 27 students in the premises of the Hôtel d’Angleterre in Lausanne with a vision of professionalizing hotel management. His ambitious project turned out to become one of the most famous hotel schools in the world; this year with nearly 3000 students from 115 countries. 800 people from all sorts of live, politicians, hospitality professionals and EHL-graduates gathered at EHL’s headquarters high above Lausanne to celebrate the occasion, and enjoy «A dream for Tomorrow», a show exclusively created for the event. The musical was composed by Hervé Klopfenstein, visually created by Romain Rossel and staged by the actresses Anne Richard and Viviane Bonelli. On this special occasion, the institution was honoured by the presence of Federal Councillor and Minister for Economics, Education & Research Johann Schneider-Amman, and the State Councillor Philippe Leuba. 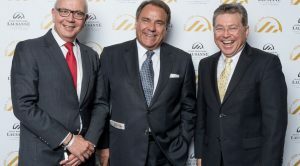 Among other guests was LCP Associate & Hospitality Investments Director Daniel Tschudy, represented above together with Michel Rochat, EHL CEO (left) and André Witschi, EHL President (right). Today, EHL is supported by a worldwide alumni network of some 25’000 graduates and in cooperation with several educational institutes around the world. On the same time, EHL now plans its first Campus abroad, envisaged to open 2020 in Singapore. LCP is a boutique international investment and development consultancy offering Family Office services that specialize in real estate, precious metals, and fine art. LCP provides a wide spectrum of diversity in cultures among its partners and associates, with many different professional backgrounds. We are global and yet distinct with a human scale service guaranteeing our international clients’ the utmost confidentiality. It is this unique feature that makes us exceptional in our relationships with the most distinguished corporate entities and UHNW individuals across the world.